This beautiful set contains nine single ended hooks in a spectrum of colors so bright and lively that it takes away one's breath! The shiny silver tips allow for ease of crocheting with any color. The lustrous metallic shades color code the sizes, and the perfectly smooth surface makes for quick and sure crocheting. These hooks are very light on your hands. The nine hooks included are US size C (2.75mm), D (3.25mm), E (3.50mm), F (3.75mm), G (4mm), 7 (4.5mm), H (5.00mm), I (5.5mm) and J (6mm). all packed in a red and blue fabric zipper case. The innovative Royale needles are colored polished birch wood, with shiny metal tips that ensure a perfect taper for each tip. These needles combine light weight with warmth, smooth feel and strength. Each size of needle tip is a different color for easy identification. The flexible cords are easy to use and store. This set is so economical and useful for knitters of all levels. 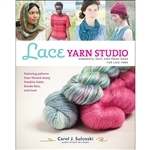 It makes a wonderful gift for your favorite knitter or for yourself.